The legendary Wigwam Stage and PA System. For a magical party, fete or concert, hire this iconic stage with PA system of stunning clarity and spectacular lighting. We can supply entertainers too, from belly dancers to brass bands. 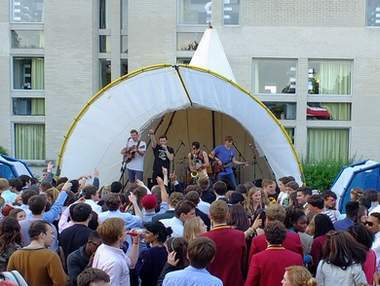 Wigwam stage hire has been integral to the running of Strawberry fair in Cambridge since the 1990s. With configurations from 25 to 44 square yards, our stage will bring sparkle to anything from a May ball to a festival. 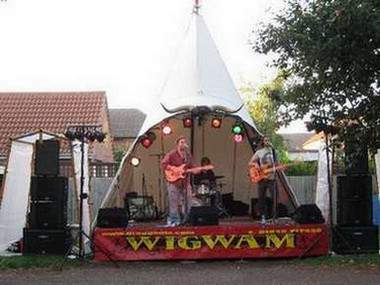 Wigwam Stage hire is based in Suffolk, within easy traveling of Norfolk, Essex, Bedfordshire. Kent and Cambridgeshire. We will travel the UK to bring the stage and PA system to you. Ours is a reliable and affordable service that will facilitate a successful event, leaving you in control but still free to enjoy the party. With hundreds of delighted customers you will be in safe hands with Doogal and his team. Visit the Gallery page to see how your event can be something really special.